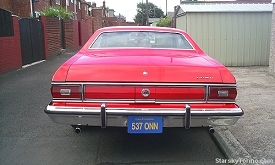 I don't have a whole lot of information about Neil's car, but I know it has a 351 Cleveland engine (some say the Clevelands were better than the Windsors) and he bought it in the Summer of 2007. He only had it for two months when he took some kids to their prom in it, and he says they were much cooler than the kids who took limos! 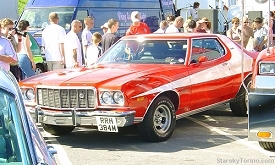 Neil's car is still sporting its Gran Torino Sport emblems on front and back, and "Sport" script on the pillar where the white stripe comes down from the roof. Also note the chrome molding in front of the front wheels. 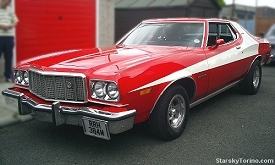 These are just a few of the minor cosmetic differences between a Gran Torino and a Gran Torino Sport. 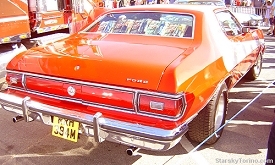 A plain Torino would originally have none of these emblems or trim pieces. Granted, the colors in these photos is way off due to the camera settings and lighting conditions, but 2B Bright Red Torinos DO look slightly orange under harsh lighting - and so the name "striped tomato" really is fitting for these cars! 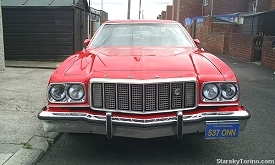 Although Starsky once commented on the TV show that his car was "Candy Apple Red," it never was. That just sounded good to the script writers. Candy Apple Red has a slightly purple-ish tint to it, rather than a slightly orange-ish tint. Speaking of orange, this is Neil's 1968 Dodge Charger. Now, why he would paint a rebel flag and an 01 on a nice car like that is beyond me. What? It's from a TV show? Oh. Okay. I can completely understand giving a car a strange paint job because of a TV show. Shucks, ya'll know I'm kidding! 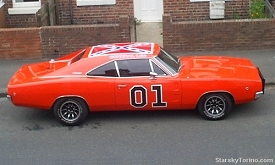 This is, of course, the other coolest and most recognizable TV show car in the world - the famous General Lee. 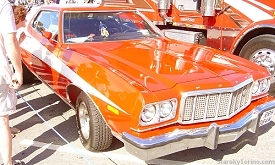 If I was King of the World, every S&H Torino owner would also have a General Lee. AND I'd have all county road crews remove the bridges over all creeks and leave big piles of dirt on both banks for ramps - Yeeeeha! S&H Torinos in the U.K.